Like the Kodiak jacket, the Kodiak pants are sold in European sizes. To help you choose a size, we’ve developed the size charts below. You’ll need to measure your waist and choose a size that is big enough for you. The pants have waist adjusters so they can be snugged down, but they don’t adjust larger, so be sure and pick a size that is big enough. The pants are sold in “Regular” sizes in both the standard inseam and a tall inseam, so choose the one that is best for you. There is also a “short” or “stout” version offered which have slightly larger waist bands and shorter inseams than the “regular” choices. I can’t say why, but they are labelled in sizes 25, 26, etc which must mean something to Europeans, but not to me. Anyway, just use the “D” size chart below to choose one of the shorter inseam pants if that is what you need. The Kodiak pants are made to work with the Kodiak jacket to give you the complete riding outfit. These are very much like the Badlands Pro pants… the most rugged pants we sell (to date). These pants were initially designed for the European market so that is why the sizing (described above) is based upon European men’s sizing rather than US sizing. As I said, these pants are very similar to the Badlands Pro pants, but the main notable exception is the use of perforated leather at the knees rather than the Superfabric used with the Badlands pants. This will compliment the looks of the Kodiak jacket that has similar reinforcements. The shell material used in these pants is made with Gore-Tex fused to the back side which makes the pants waterproof but breathable. There are no separate layers or liners to make them that way. Inside, the pants are lined with softer nylon material for comfort. And on this pant, there is an additional layer of slide protection… the perforated leather mentioned above. The armor package here is very robust. All the armor is D3O, but its the new Aero Pro version. Its noticeably large than the “standard” D3O we are used to seeing in other gear and it has larger holes for air to pass through. All of it is THICK and CE level 2 rated. You get two knees, two hips and even a pad over the tailbone. Have a look at our photo gallery. We’ve removed the armor so we could show it to you. There is nothing else to buy. Like the mating jacket, this pair of pants has LARGE zippered vents in front that open up directly to the inside, so wind can enter directly to your body. In back, there are a couple exhaust vents. With the excellent venting setup, these pants should work for nearly all weather conditions provided you layer underneath appropriately. The pants are adjustable not only in the waist, but also behind the knee and around the leg end (to adjust for different types of boots). The overall fit of these pants is for standard touring… a bit more trim than most of Klim’s pants which are primarily aimed at the adventure market. And you’ll notice the width of the leg openings is a bit smaller than the Badlands Pro pants. For example, the cuff opening of the size 52 pants we used for photos is about 17”, but other styles in the Klim line are about 20”. 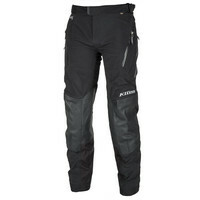 Since these pants are aimed more at touring riders, they have the smaller leg opening to accommodate sport touring boots which are much more trim than more bulky adventure touring boots which would be the choice with other Klim gear.